“The turnout was superb, it exceed our expectations,” said Eoghan De Faoite, Chairman of the organising rally committee of Rally for Life 2007. Eoghan was speaking to TV3 at the hugely successful pro-life rally on the 7th July. The theme of the rally was to ‘Celebrate Life’, and brought pro-life people out in their thousands to oppose abortion – the largest crowd to do so in some 15 years. The Irish Times described the event as having a “carnival-like atmosphere”, as thousands of families and young people held balloons and placards in the brilliant sunshine. After weeks of non-stop rain, prayers had been rewarded with a glorious day, and as the huge crowd waving flags, balloons and placards set off from the GPO, Dublin, heads were spinning as the colour and the enthusiasm of the rally grabbed the attention of thousands of shoppers on a busy Saturday afternoon in Ireland ’s Capital. The rally led off with a massive banner, held by a number of young women, calling on the Taoiseach, Bertie Ahern, to keep his pre-election pro-life promise and not legislate for abortion or allow for embryo research. 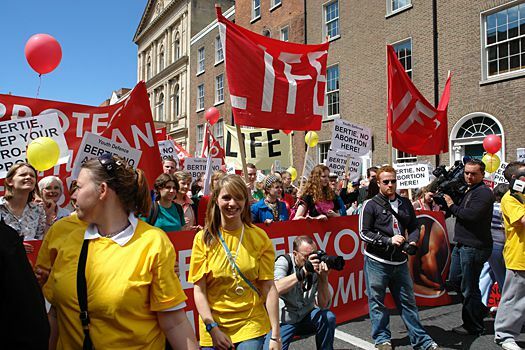 Prior to the recent D áil elections, pressure was put on the main political parties to guarantee that, if elected, they would not enact anti-life legislation. Fianna F áil and Fine Gael both gave this guarantee, and YD organised the hugely successful rally to remind Bertie ’s new government that this was one political promise that could not be broken. The rally arrived at the Dáil to the sound of the song ‘Life is Life’ booming out from a public address system. Molesworth Street opposite the Dáil was closed off by the Gardai to accommodate the massive crowd who made their way towards a stage decorated with huge pro-life images. Speakers from all the major pro-life groups including Mother & Child Campaign, Precious Life, Our Lady of Guadalupe Life Movement, Bunreacht Beo, the Pro-life Campaign and Fr Brian McKevitt of the Alive newspaper addressed the cheering crowd. Niamh Uí Bhriain of the Life Institute opened the speeches with a rousing welcome. Niamh told the crowd that the Irish people had a long and exemplary history of protecting the vulnerable and of treasuring children above all things. “The great Irish chieftain, Shane Ó Néill said that the Irish people kneel to no-one but God. We will not allow the EU, nor the abortion industry, nor this government to force our nation to accept the slaughter of innocent children, ” she said. Fr Brian McKevitt said that people should not be afraid to stand for Life and drew attention to the disgraceful decision of Amnesty International to support abortion, calling for Catholics to withdraw from Amnesty. Other speakers spoke of the need to be organised in defence of Life, and Carolyn Johnston of YD told the rally of YD ’s efforts to counsel young mothers outside abortion referral agencies. The Bishop of Phoenix, Arizona, Rev Thomas J Olmstead, was amongst the huge crowd in attendance at the rally. Bishop Olmstead was visiting Ireland for a number of days and had picked up a leaflet advertising the rally in the Pro-Cathedral in Dublin and decided there and then that he would attend, changing his flight plans to do so. Bishop Olmstead also attended the evening events at the Alexander Hotel where he concelebrated Mass with Fr Brian Mc Kevitt. After Mass, Bishop Olmstead addressed the packed room and told of how impressed he was with the rally and the work of pro-life people in Ireland. He also commended the speakers at the rally saying that their words ‘were very well chosen’. He said he was encouraged by the fact that Ireland had resisted the tide of abortion and also spoke of the importance of pro-life action to keep a country free of abortion. He commented on the number of people killed in the forced Irish famine of 1845 saying that abortion claims the same number of lives in his country every year.